Multiracial Americans of Southern California (MASC), a 501©3 non-profit organization dedicated to educating, supporting, and advocating for the multicultural community, multiracial, biracial, and trans-racially adopted people and families for over 25+ years announced details for Race and Diversity – Conversations with our Children event to be held on May 21st, 2016. The event will be held at World City Center nestled in the historic West Adams District of Los Angeles. 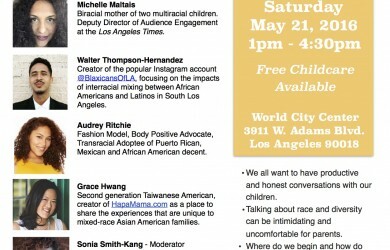 This event will draw attendees from all over Los Angeles, for a panel discussion on how and when to begin speaking with children about race. Event attendees will be provided with conversation starters, helpful information, and educational resources to empower attendees and the children in their lives to talk about family heritage. “We strive to empower our children to recognize, celebrate, and share the gifts that other cultures offer and thereby positively impact the thinking of the next generation. In order to do that, we need to provide Parents, Caregivers, and Teachers the appropriate resources and tools to do so.” Says Sonia Smith-Kang, MASC Vice-President, Blogger, and Founder of Mixed Up Clothing a fashion brand the Celebrates Cultural Diversity. WHEN: Saturday, May 21, 2016 from 1:00 PM to 4:30 PM (PDT) Please arrive at 12:30. PLUS: Bring the kids! World City Center will provide fun childcare activities during the seminar! Michelle Maltais: Biracial mother of two multiracial children. Deputy Director of Audience Engagement at the Los Angeles Times. Walter Thompson-Hernandez: Creator of the popular Instagram account @BlaxicansOfLA, focusing on the impacts of interracial mixing between African Americans and Latinos in South Los Angeles. Audrey Ritchie: Fashion Model, Body Positive Advocate, Transracial Adoptee of Puerto Rican, Mexican, and African American decent. Grace Hwang: Second generation Taiwanese American, creator of HapaMama.com as a place to share the experiences that are unique to mixed-race Asian American families. Sonia Smith-Kang - Moderator: Designer / Founder of Mixed Up Clothing, an ethnic-inspired children’s fashion brand that celebrates global diversity and inclusion. Famed blogger on the Mixed Up blog, regular contributor to The Huffington Post and Modern Mom Magazine. Interracially married multiracial person and mother of four. For more information and to purchase tickets: http://www.eventbrite.com/e/race-and-diversity-conversations-with-our-children-tickets-24470084682 Please note: Tickets must be purchased in advance of this event as seating is limited, reserve your spot today! Special thanks to our sponsors: World City Center, CurlyKids HairCare "Custard for Kids" sold exclusively at Walmart, AquaBall Drink, SkinnyPop Popcorn, and Happy Family Brands.